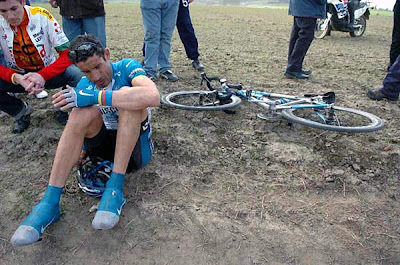 He broke his steerer. He looks so sad. NOT busted carbon. That was an aluminum steerer. Fork was off a lower end Trek model, something with more rake... like a Pilot maybe? 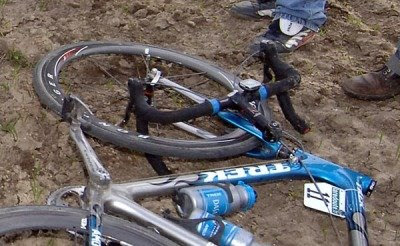 Agreed, alloy steerer on cheaper fork that was fitted for Paris Roubaix, I can't recall if it was for different geometry or some other reason, there is a nice vid of George sitting up holding onto the bars right before crashing.